21 months had passed since we first moved into our flat, and it was finally time to renovate our bathroom. Due to my lack of experience in house renovations, it took me a lot of research and careful planning to get to a state where I was comfortable enough to go ahead with the project. The old bathroom, seen in the image below, appeared to have been recently renovated, albeit not to a high standard. The floors were covered in vinyl that was cut to shape around the units and warped in various places. The floorboards underneath had not been properly secured and squeaked as we walked on them. The bath was also slightly unstable, gradually prompting the bath seal to break and separate. The electric shower leaked, and the ill-suited L-shaped bath rail did a poor job of stopping the water from splashing onto the bathroom floor and dripping into the hallway. A photo of the old bathroom, taken from the from the original listing. It doesn't stop there. The toilet was unnecessarily bulky and the pedestal sink took up a lot of space while providing no storage. The towel rail extended out far enough to become an obstacle which I kept repeatedly bumping my elbow onto. The walls were not water resistant, the vinyl was not properly sealed, and the exposed pipework was not tastefully exposed, just carelessly so. But perhaps the single most annoying aspect of the bathroom was the lack of a mixer tap. One tap supplied extremely cold water and the other one supplied extremely hot water. This is not unusual in Britain, but it is outrageously impractical, and it baffles me that people still choose to install separate taps in new bathrooms. There were certain aspects of the old bathroom that we did enjoy. The bathroom was white, and as it was east-facing, it got drenched in sunlight every morning. The position of the mirror helped reflect the light and make the room feel nice. We wanted to retain that airy, comfortable feeling, but given all the issues mentioned above, it seemed like our best option would be a full renovation. My amatuer ASCII floor plan. The units were in the best possible position given such an awkwardly narrow bathroom, and so we kept things more or less where they were. The bathroom measured 3 meters long and only 1.2 meters wide. We managed to shave an additional 5cm off the width of the bathroom by removing multiple layers of tiling hidden behind the wall panel. Sadly, the original 3.2 meter ceiling had been lowered to a mere 2.8 meters, which is arguably still high. Removing the false ceiling would have been risky as the condition of the walls and ceiling above is unknown, and so despite my usual commitment to authenticity, we retained the false ceiling. To retain the airy feeling, we opted for white tiles on the walls. Given that our flat is Victorian, we chose metro tiles as a nod to the era, flat ones rather than beveled-edge ones as they're less fussy. We tiled the two walls near the bath all the way to the ceiling, and tiled the rest of the walls roughly to the height of the window. For the bathroom floor, we opted for large concrete-effect porcelain tiles, 0.75 square meters each, to be exact. There is probably nothing I love more than concrete (except maybe marble) and these tiles are particularly smooth and nice to walk on. The size of the tiles was carefully selected to work with the dimensions of the room; we were able to lay 4 tiles along the length of the bathroom plus one additional tile, cut to 75x20cm, for the door strip. We plumbed everything through the walls, and then tiled the entire room. The units were then placed on top of the tiles and fixed into place. While this is standard practice in places like Saudi Arabia (where I come from), I'm told that it's unusual in Britain; builders first fix the units into place and then tile around them, because it's more cost effective this way. I insisted on the more principled approach of tiling everywhere first, and treating bathroom fixtures as add-on items. This also means that should the toilet or the vanity break, we can replace them without worrying about exposing untiled areas due to mismatched sizes. It also ensures that spills in the bathroom don't leak onto the neighbours. Aesthetically, it gives the bathroom a finished look; I love that I can see metro tiling inside the vanity when I open the drawer! Small pleasures. It took me a lot of searching to find the right bath rail. It's U-shaped and is designed to be cut to size. It's solid and very nice indeed. The metal has a slightly warm tinge to it which I wish the shower fixtures matched. I'm especially fond of the industrial detailing and don't mind at all that it was one of the more expensive items in the bathroom. The mirror cabinet is another favourite item; long and narrow to emphasise the high ceilings and placed in the same position as the old mirror to continue to reflect the light in beautiful ways in the morning. Despite being an afterthought, the mirror cabinet slotted right in and worked well with the surroundings. As for the toilet, I had had my eyes on this one for many months: a dainty, short-project toilet with a narrow yet wide cistern and a very nice squared shape and rounded edges to replace the old large bulky toilet. As for the radiator, a super slim convector radiator, only 8cm deep, replaced the chunkier old one. 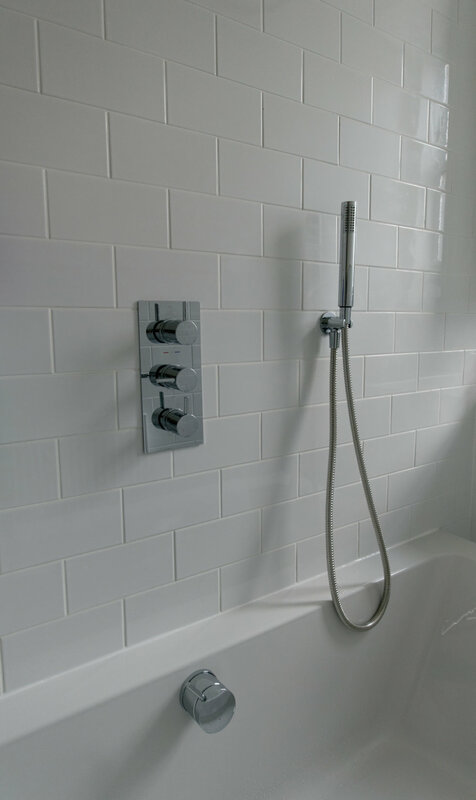 Heated towel rails while trendy take up a lot more space. I also find that their surface gets extremely hot, and touching them accidentally is always a bit of an uncomfortable experience. They do look really nice in larger bathrooms. A double ended bath with a squared appearance matching that of the toilet and the sink gave a sense of coherence to the design of the bathroom despite the units not being part of a single range. It's another item I've had my eye on for a while. Sadly, the plain bath panels I ordered turned out not to be flat, but rounded, and were rather flimsy. Our joiner made us tongue and groove panels, which are solid but are fussier than I had intended and thus might still replace them with plain ones at a later date. When the lights are out, our bathroom appears monochromatic, which ties in nicely with the rest of our flat. Take another look at my concrete tiles. We still need to strip the lining paper off, prep the walls and paint them, but otherwise, we're done! The bathroom has been a pleasure to use. Next stop: kitchen renovation!